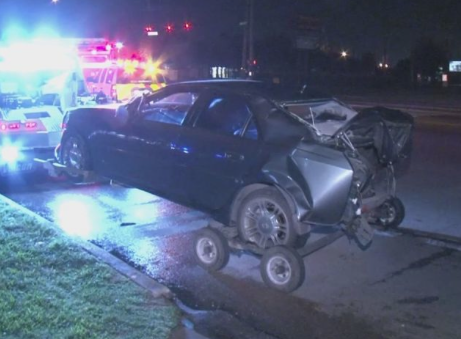 A man was loading a lawnmower onto his truck when a speeding driver struck a parked car, pushing it into the man and seriously injuring him. The accident happened late Wednesday evening in the 10,000 block of Pine Cone Lane in Houston, and was witnessed by the man’s son David Mena, who was interviewed by Channel 13. The 20-year old driver who was at fault for the crash fled the scene, leaving the victim unconscious. 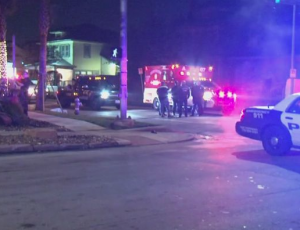 The victim was transported by Life Flight helicopter in critical condition, and police were able to arrest the suspect who had been chased by the victim’s neighbors. 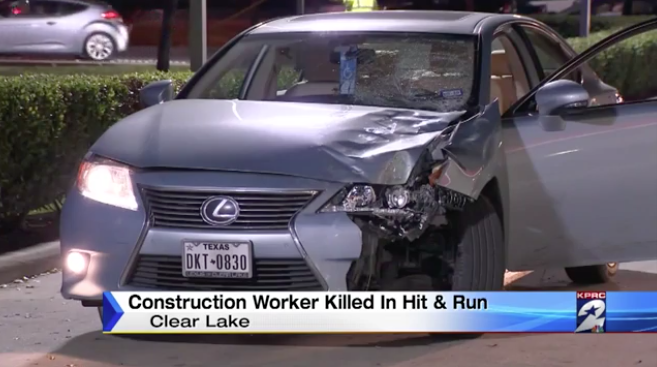 A man in his early 20’s was killed in a hit-and-run accident in the Montrose area of Houston this morning. The man was crossing in a pedestrian crosswalk at the intersection of Westheiemer and Taft when a black-colored sedan ran a red light, hitting the man and fleeing the scene. The vehicle will have visible damage from colliding with the pedestrian; anyone who has information they think might help police should contact Houston Crime Stoppers at 713 222 TIPS. 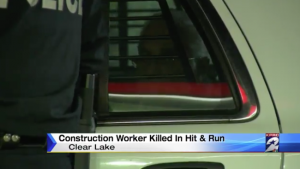 A 78-year old driver may be facing charges after he fatally struck a construction worker and kept going. The worker was apparently trying to cross Galveston Road between Pineloch Street and City Lake Boulevard when he was struck by the northbound silver Lexus outside an athletic complex. Instead of stopping the elderly driver of the Lexus kept going until he was pulled over by a witness. Police performed sobriety tests on the driver at a nearby gas station and then placed him in custody for further questioning. The name and age of the deceased construction worker has not been released. An alleged hit-and-run driver is in police custody after a serious car accident on W Mount Houston at Veterans Memorial last night. 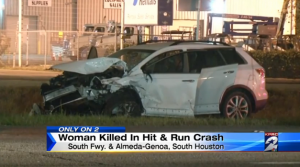 Police say the hit-and-run driver struck the rear of a black-colored Cadillac sedan that was stopped at a red light, causing major damage to the Cadillac. The at fault driver then fled the scene of the crash but passed out while driving and struck a pole by the roadside. Two occupants of the Cadillac were taken to hospital in serious condition, not surprising given the amount of damage to the back of their vehicle. Family gathered recently to celebrate the life of 62-year old Hope “Anna” Vu, who died in a multi-vehicle crash on Tuesday evening. The driver of a white Mazda, pictured below, was weaving in and out of traffic at high speed on Highway 288 before he crashed into the rear of a black Acura sedan driven by Hope’s son. The Acura was then pushed into two other vehicles, including a red Volkswagen car. 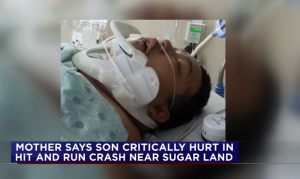 Hope was riding in the back seat of the Acura; Hope’s son was treated and released at Ben Taub Hospital but the son’s fiancee remained hospitalized with internal injuries. The driver of the white Mazda, described as a Hispanic male around 20-years old wearing a red shirt and red jacket, jumped out of the wrecked vehicle and fled the scene. Despite searching with K-9s and a helicopter, the police were unable to track the driver down, including at the Pearland address of the registered owner of the vehicle. Call 713-222-TIPS if you have any information on the driver’s whereabouts. You can tell from Channel 2’s interview that Hope was very close with her family and will be missed. Hope survived the Vietnam War and was brought to the United States by her family in the 90’s. 19-year old Josey Scott of Shepherd, Texas was fatally struck by a hit-and-run vehicle while jogging eastbound on FM 2666, about four miles west of Shepherd. Texas Department of Public Safety investigators say there was minimal debris left at the scene of the accident, which happened around 7:30 p.m. on Tuesday February 11th. Troopers think the hit-and-run vehicle may have been a teal or green-colored Chevrolet pickup truck, late 80’s model, with significant damage to the front of the vehicle. Anyone with information that may help law enforcement track down the driver who killed Josey and callously left her in the roadway should call Lufkin DPS at 936-699-7340. 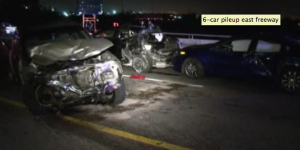 The driver of a pickup truck caused a six vehicle accident last night that killed a motorcyclist, then fled the scene before the police arrived. 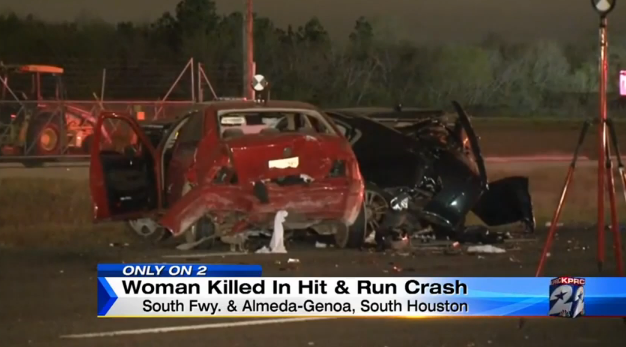 The crash happened around 10:30 p.m. on the East Freeway in Houston. A 2006 GMC Sonoma apparently became impatient due to backed-up traffic and decided to drive on the inside shoulder. The truck struck a motorcycle, causing the motorcycle to collided with a 2014 Dodge Dart passenger car; the motorcyclist slid into the center lane of the roadway, while the motorcycle hit a wall and caught fire. The GMC Sonoma picked then rear-ended a 2011 Cadillac CTS; the Cadillac then hit the Dodge Dart and also a 2014 Ford F-150. The motorcyclist was transported to Memorial Hermann Hospital where he died; the two men in the GMC pickup fled the scene on foot. 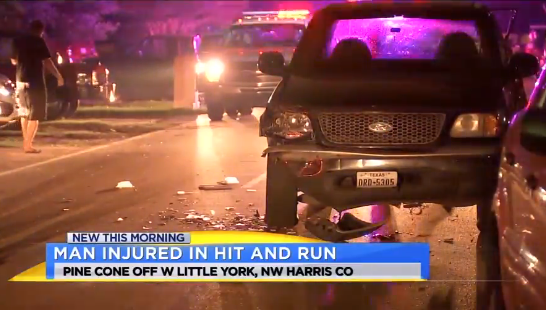 A man was pushing an SUV on the feeder road of Highway 59 in Humble early this morning when he was struck from behind by another vehicle. Instead of remaining at the scene to help the severely injured man whose leg was severed in the collision, the rear-ending driver fled the scene. Fortunately a witness was able to follow the vehicle responsible and provided police with the license plate and a description. Meanwhile another passerby rendered aid to the injured man. The accident happened on the northbound feeder, according to Channel 2 Houston. 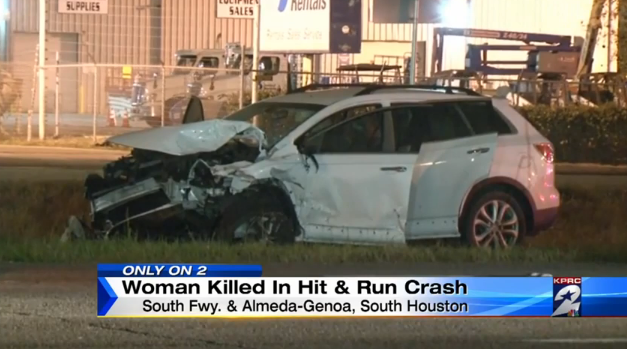 A suspected hit-and-run, drunk driver hit and killed a female pedestrian at Westheimer Rd. and Joel Wheaton Rd. last night. The woman was struck outside a shopping center around 9:30 p.m.; the driver fled the scene but his car broke down at Westheimer and Gentryside and he was arrested. He will likely face a charge of intoxication manslaughter.